If there’s a choice to be made between groom preparation shots and bridal, the bride tends to win so I don’t often get to shoot the boys getting ready. Luckily Sebastian and his friends were happy to get ready early and then just chill out for the morning. So, as he was on the way to Geneva, I was able to stop off and get all the fun and games in the bachelor pad. 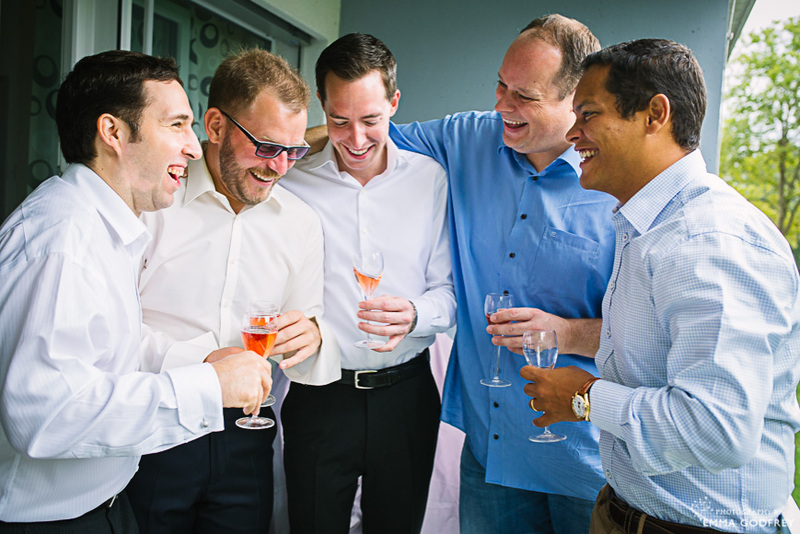 As well as capturing all the little details, the boys were only too happy to crack open some champagne and hang out on the balcony for pictures. 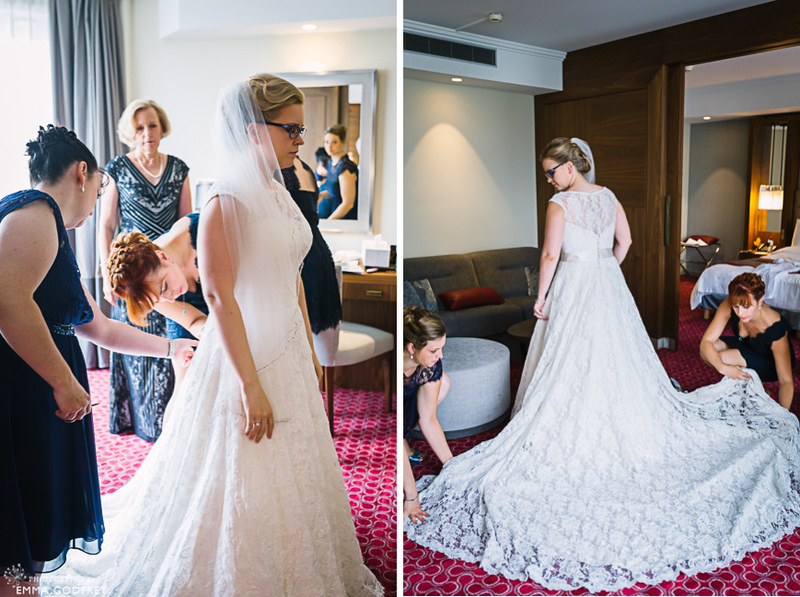 Meanwhile, Susan was beginning her preparations surrounded by her mother and sisters at Damien & Co at the Kempinski Geneva. 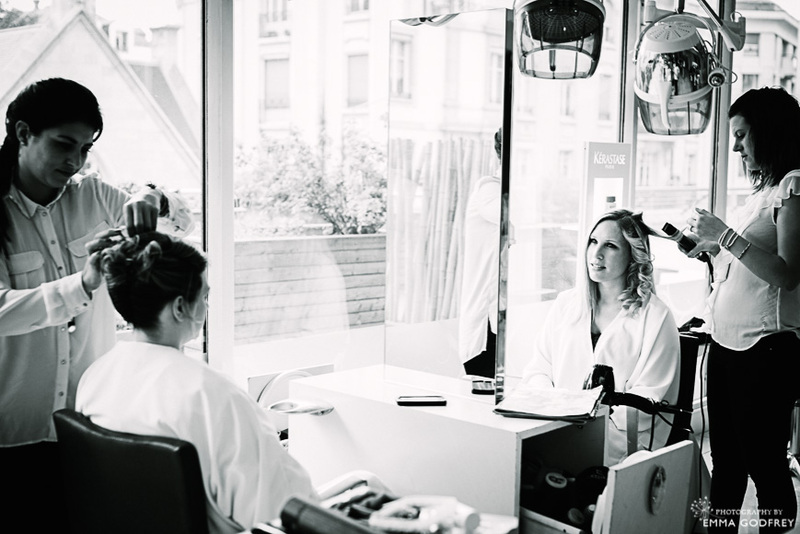 I loved shooting with all the mirrors in the salon, giving the hair and makeup a buzzing feel that really summed up the beginning of the day. There was also time to slip off with Susan’s sisters to her room to shoot the dress, jewellery, flowers, invitations and shoes. It was lovely to capture the girls as they helped their baby sister into her dress, full of tips and knowledge on how best to do up tricky buttons and secure the fabulous train. 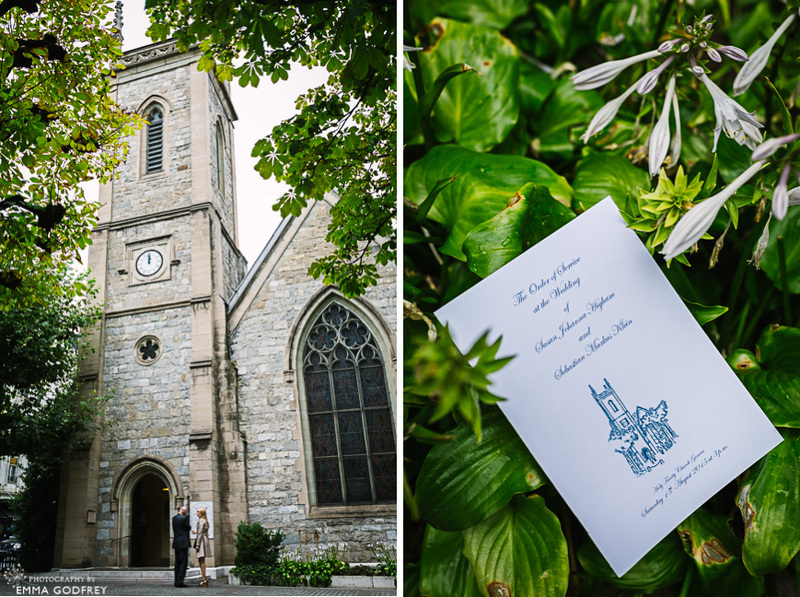 The ceremony at the Holy Trinity Church in Geneva was very intimate and atmospheric. The church itself is quite a dark place to shoot but it is important to me to be as respectful and discrete as possible so I never use flash during the ceremony. I want to capture the moment but in no way disturb it, this part of the wedding should just be about the couple. 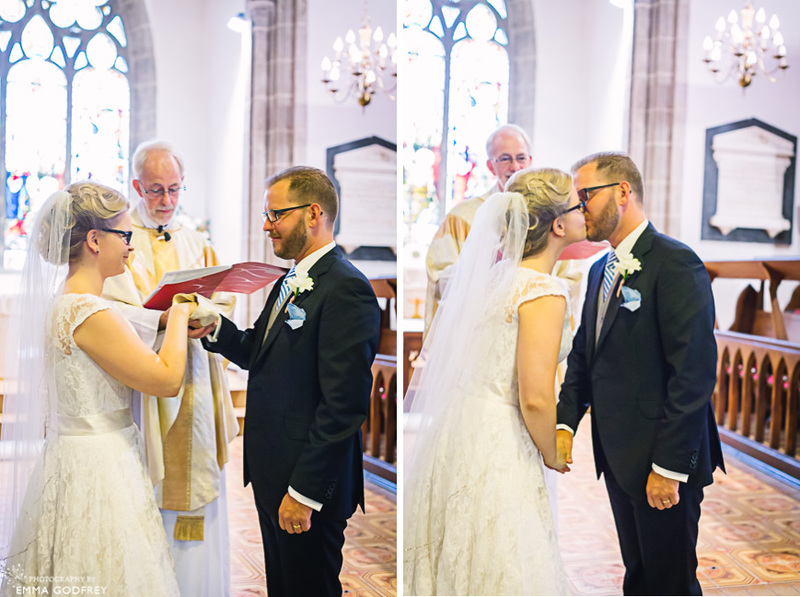 The best compliment for me is always when the vicar asks if I took any pictures! I really love the resulting images, with shallow depth of field and selective focusing, the mood of the moment shines through. After the ceremony, Susan and Sebastian decided not to do a grand exit but rather a receiving line. It’s not as common any more but is a lovely way to say hello to all the guests. The couple managed to keep the line moving to not take up too much time. And their friends and family were much more focused on chatting and catching up than taking hundreds of photos of the couple, meaning lots of lovely candid shots for me and for the newly weds. Sebastian has worked in event management so had already thought of the challenges of moving an international crowd between locations. Their two locations were within easy walking distance of each other and a bus was on standby for bad weather. We had chosen a spot halfway between the church and Kempinski for the formal group shots. With much welcome help and entertainment from the bestmen and bridesmaids we were able to move through the groups list quickly and merrily. Meanwhile the remaining guests were welcomed at the hotel for coffee and cake, and a simple Photo Booth with props from the couple to keep them amused. 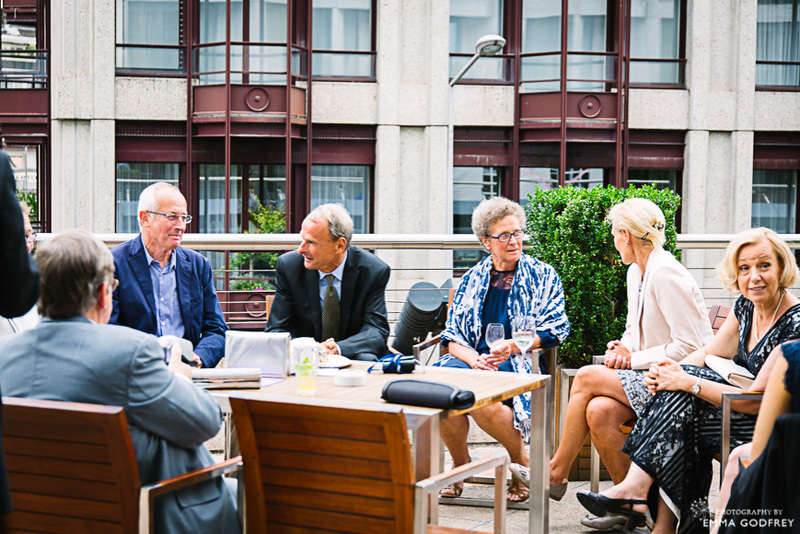 Keeping things simple is a must for big weddings and, while their guests were enjoying the hospitality of the Kempinski, Susan and Sebastian opted for Jetside couple photos. We had chatted about taking a car to the botanical gardens or further down the lake, but in the end they decided that they would rather save the travel time for more pictures and time with their guests. With beautiful locations I always think it is important to balance the location with timeless portraits of the newly weds that will still look fresh and elegant on their Ruby wedding anniversary. I hope that these will fit the bill. We finished off the couple portraits in the Kempinski itself, capturing some of the fun and silliness that are such a big part of these two lovely people. It also gave Sebastian a chance to change and the bride time for cookies! Greta and her Kempinski Geneva wedding team had done a wonderful job with the large ballroom. 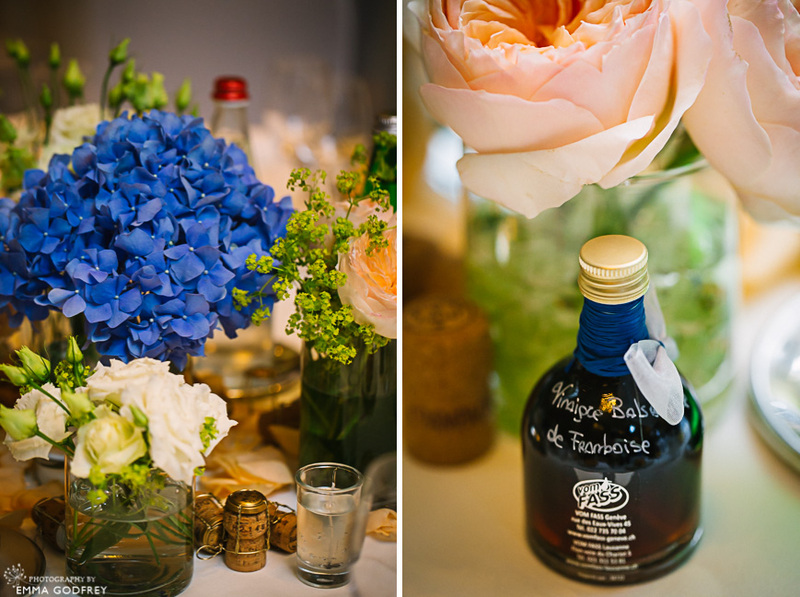 The decor of blue hydrangeas and delicate white flowers was in perfect keeping with the couple’s theme. And the cake was just perfect. The whole ambiance of the evening was one of calm and smooth running. 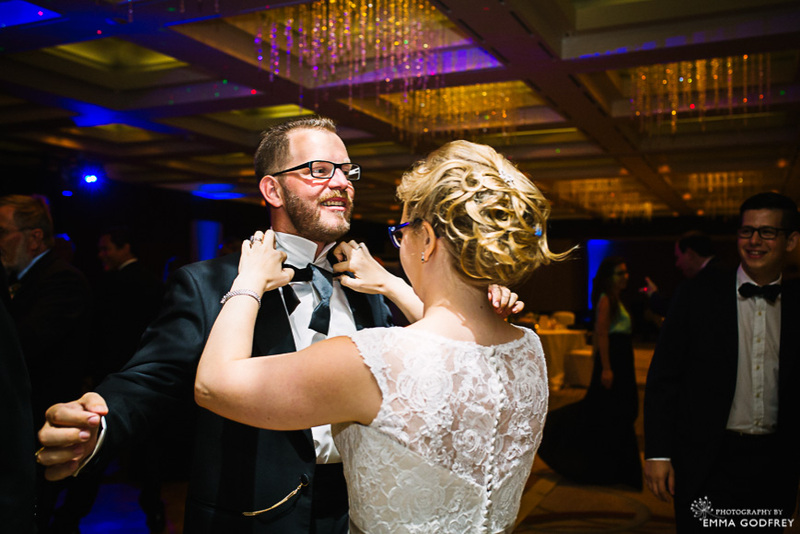 The couple had chosen to keep lots of traditions, including speeches between the courses and dances with father and daughter, mother and son. They also had a new one for me, choosing to move tables between each course to better spend time with their guests. It was a lovely idea and also meant I could follow them around the room for candids. As I left them to dance into the night, I was so happy to hear them tell me what a wonderful day it had been.